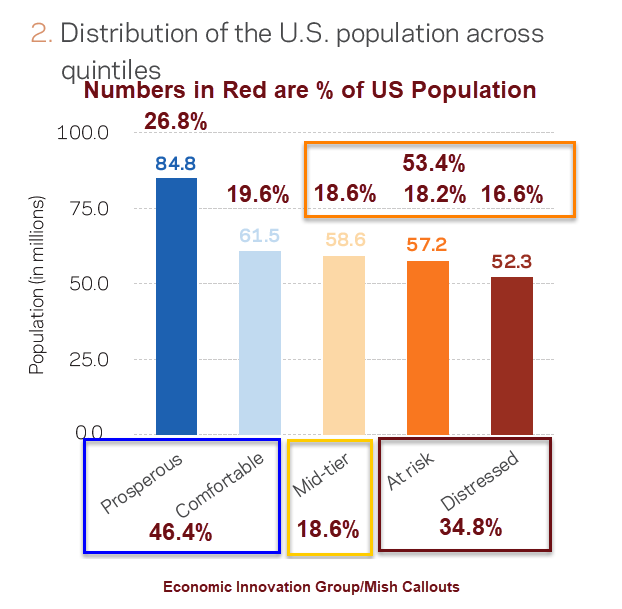 Economic prosperity is concentrated in America's elite zip codes, but in an interesting report on Distressed Communities, from The Economic Innovation Group, it is increasingly clear that economic stability outside of those communities is rapidly deteriorating. As Axios noted, this isn't a Republican or Democratic problem. At every level of government, both parties represent distressed areas. But the economic fortunes of the haves and have-nots have only helped to widen the political chasm between them, and it has yet to be addressed by substantial policy proposals on either side of the aisle. Distress is based on an evaluation of seven metrics. Over half the population in distressed communities are minorities, compared to only about a quarter of the population in prosperous ones. Asians and whites are more likely to live in a prosperous zip code than any other type of community. 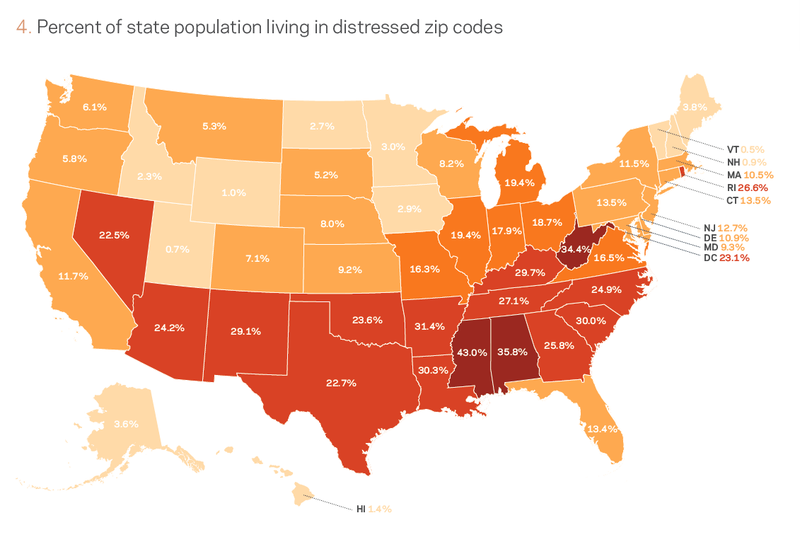 Blacks and Native Americans are more likely to live in a distressed zip code than any other type of community, while Hispanics are most likely to reside in an at risk one. Blacks and Native Americans are three times more likely to live in a distressed community than a prosperous one. 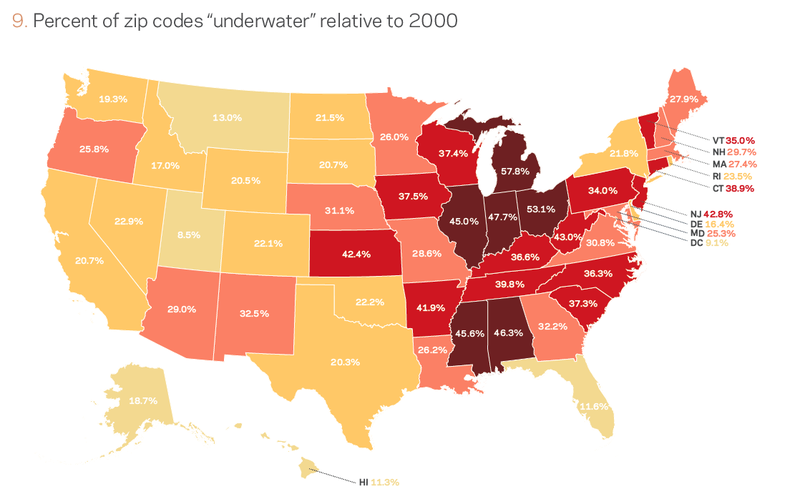 Majority-minority zip codes are two times more likely to be distressed than the average zip code. Republicans dominate at the very top of the distribution, representing nine of the 10 most prosperous congressional districts in the country. Most of these are suburban enclaves around fast-growing metropolitan areas, for example on the outskirts of Dallas, Denver, Houston, Minneapolis, Phoenix, and Washington, DC. Expanding to the entire top quintile, Republicans represent 63 percent of the country’s prosperous districts compared to Democrats’ 37 percent. Conversely, six of the country’s 10 most distressed congressional districts are represented by Democrats. Eight of the 10 are located in the South, with Ohio’s 11th (Cleveland) and Arizona’s 7th (Phoenix) as the two exceptions.